The 2018 midterm elections could be the most consequential election in our lifetime. The possibility of the Democratic Party retaking the House of Representatives and/or the Senate could have a significant effect on the rest of President Trump’s term. Historically, the party that is the opposite of the president wins in the midterms. The exceptions to this notion are in three cases, the years 1934, 1998, and 2002. In 1934, Franklin D. Roosevelt was the President, and the Democratic party gained 18 seats (9 in House and 9 in Senate). In 1998, while President Clinton was facing impeachment, the Democrats picked up 5 seats (5 in House). In 2002, President George W. Bush was leading the country post-9/11, and the Republicans gained 10 seats (8 in House and 2 in Senate). For more in depth information about the history of midterm elections check out this article, written by Tom Murse. Solid democratic states have very little chance of a republican winning; the running democrats have little to no chance of losing in November. These states are for instance, in California, both of the running senators are from the Democratic party, because of California’s jungle primary process where the top two vote getters in the primary, no matter the party, move on to the general election with Incumbent Dianne Feinstein leading as the favourite. Minnesota is holding a special election on top of the regular senate elections because the previous senator resigned due to sexual assault allegations. For the statewide election, incumbent Democratic Senator Amy Klobuchar is running against District 15b State Representative Jim Newberger. Klobuchar is significantly ahead of Newberger in the polls, making this Minnesota race a Solid Democratic state. In the special election, Democratic Senator Tina Smith is far ahead of her opponent, Republican Karen Housley in the polls. Housley and Smith have disagreed on almost all large issues, and those who support Housley have been quite vocal about their stance and her numbers have grown, making the special election likely democratic. Likely Democratic states such as New Mexico, Michigan, and Ohio are a bit more undetermined, however, there is a high chance of the Democratic Party taking the seats. In Ohio, incumbent Senator Sherrod Brown is considered too democratic for his state, but his active campaigning and skill at politics in general has given him a boost that will most likely result in him being elected. In New Mexico, Michigan, Pennsylvania, and Virginia all incumbent senators are Democrats with the opposition as Republicans. In Virginia, Democratic Senator Tim Kaine is running against Republican Corey Stewart. Stewart is between a rock and a hard place; if he wins the position (which there is a slim chance of, according to polls) he becomes a senator. If he loses, his position as Chairman of the Prince Williams County Board of Supervisors will be challenged by Martin E. Nohe, a strong republican challenger. The main thing that makes Virginia a likely Democratic state and not a solid Democratic state is Stewart’s endorsement of Donald Trump; those who voted for Trump will most likely vote for Stewart because of this. Leaning Democratic states are those that are near a toss up but have a higher chance of a Democratic senator being voted into office. Texas is the most tense state that is leaning Democratic, with incumbent Senator Ted Cruz being challenged by Beto O’Rourke. O’Rourke has served as Texas’ 16th congressional district’s representative since 2013 and his heavily left leaning views have caused quite a stir. The Houston Chronicle, a news organisation that backed Cruz in 2012, has officially endorsed O’Rourke. Although Cruz has a lead in the Polls, the official endorsements from generally conservative sites as well as continued rallying and campaigning from O’Rourke is bound to have some impact on the election results. The other leaning Democratic states face similar dilemmas, however, since Cruz is a very prominent political figure, that race has been the most publicized out of this category. Montana, New Jersey, Wisconsin, and West Virginia all have Democrats as incumbent senators while Nevada has Republican Dean Heller as incumbent. Although Heller has been endorsed by Trump, recent polls show his opponent, Democrat Jacky Rosen, at roughly equal in the polls, with whoever is in the lead fluctuating daily. The only states that have an independent in the running are Maine and Vermont. Funnily enough, Maine and Vermont are also solid independent states; there is an extraordinarily slim chance of the opposing party winning. In Maine, Independent incumbent Senator Angus King is significantly farther up in the polls than his Republican opponent Eric Brakey. This is most likely because King has a long history with Maine; having served as senator for Maine since 2013 and was the seventy-second governor of Maine from 1995-2003. In Vermont, Independent incumbent Senator Bernie Sanders is leading significantly in the polls; his Republican Opponent Lawrence Zupan is falling far behind. 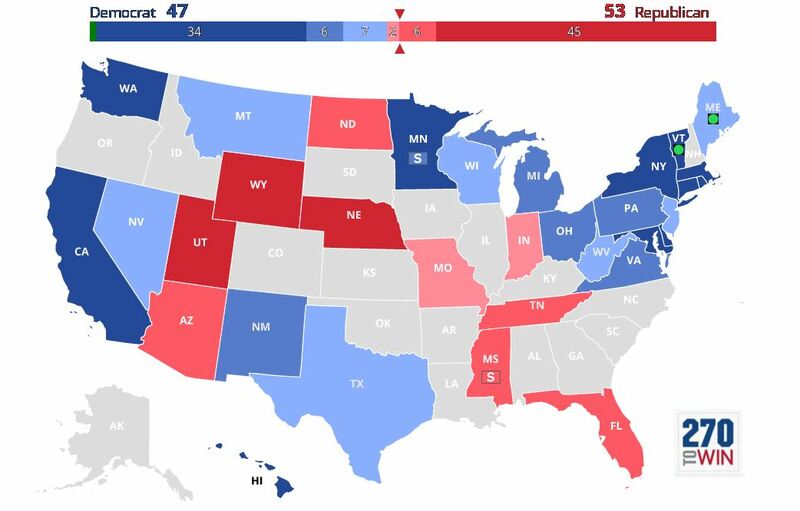 The only states that are leaning Republican are Missouri and Indiana. The incumbent Senator, Claire McCaskill, is slightly behind Missouri’s Attorney General, Republican Josh Hawley in the polls. Similarly, in Indiana, Republican Mike Braun has pulled ahead of Democratic incumbent Joe Donnelly. Some key reasons for the situations that apply to both states are a lack of involvement/ endorsements from Trump, the Senators are moderate for their designated party resulting in conflicting voter views, and a lack of explosive debates or arguments over prominent issues. The likely Republican states are North Dakota, Arizona ,Tennessee, Florida, and Mississippi (including the special election). North Dakota and Florida both have Democratic Incumbent Senators. The switch is most likely a result of the common occurrence where states with harsh party divides vote contrary to the previous elected official’s party out of anger toward their policies. Arizona and Tennessee have Republican incumbents with the Democratic opposition falling behind significantly in the polls. Mississippi is holding a special election since the previous Senator, Thad Cochran, retired due to health issues. Both the special election and regular election are turning out to be likely Republican. The regular election is between the Republican Incumbent Senator Roger Wicker and Democratic Attorney David Baria. Wicker is being faced by a solid opponent, however, the democratic party has been more focused on filling out the special election seat, therefore, Baria’s campaign has fallen behind. The special election in Mississippi is an open primary, and the candidates are Republican Cindy Hyde-Smith, Democrat Mike Espy, and Republican Chris McDaniel. The two republican candidates outweigh Espy, and even though Espy has reliably moderate Democratic views and a solid following, Mississippi’s Republican history shows that the Republicans will most likely win. 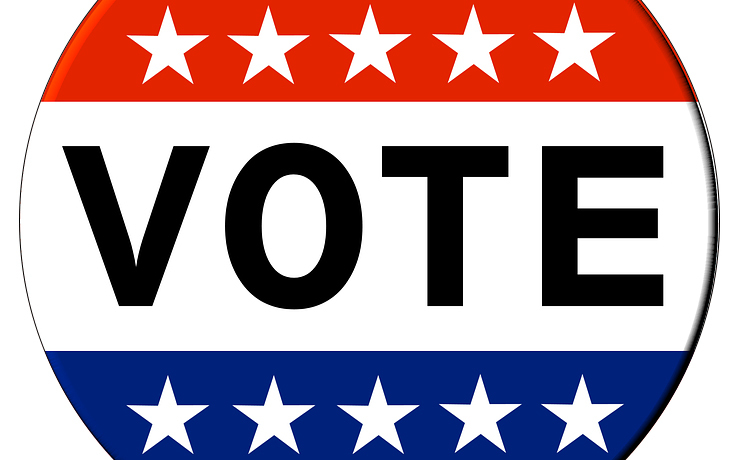 This special election is nonpartisan, and if no candidate receives the majority vote, the runoff election will occur on November 27. Since nobody approached 50% in early polling, this runoff is likely. Solid Republican states include Utah, Wyoming, and Nebraska. These states are the polar opposite of solid Democratic states; there is virtually no chance of a Democratic nominee winning. 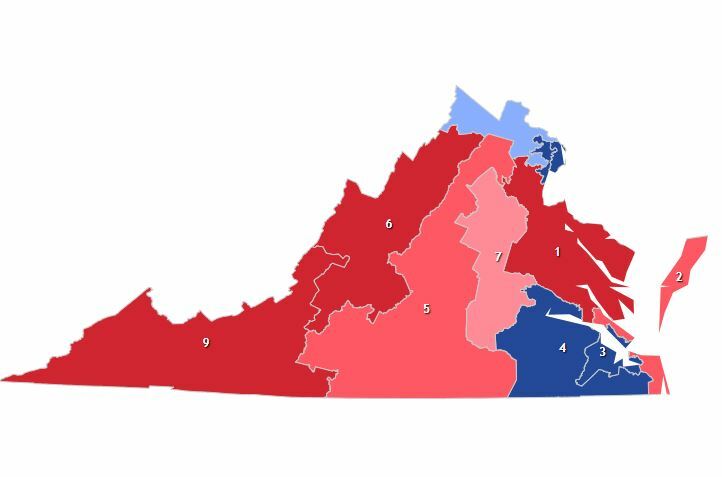 The solidly Democratic districts in Virginia are the 3rd, 4th, 8th, and 11th. These are the districts where a Republican Candidate has no chance of winning. In the 8th district in 2016, Incumbent Don Beyer won with over 70% of the vote. Since not much has changed in this district, Beyer will certainly win in this election. The only Leaning Democratic districts are the 10th and 7th. In the 7th, Republican Incumbent David Brat is running against Democratic Nominee Abigail Spanberger and Libertarian Joe Walton. Spanberger is a new face for the Democratic Party in the area, and her history with public and government service is pushing her forward, hopefully far enough to beat Brat. In the 10th, Republican Incumbent Barbara Comstock is running against Democratic Senator for the 33rd State Senate District Jennifer Wexton. Even though Comstock has won by around 10-15 percent in 2014 and 2016, Wexton is running for house in the same district she represents in the senate, giving her an advantage not possessed by Comstock’s previous opponents. The leaning Republican district is the 5th. In this district’s last house election, republican Tom Garrett won against the Democratic nominee by roughly 15%. Now, entirely new candidates are running with the Republican Nominee being Denver Riggleman and the Democratic Nominee being Leslie Cockburn. The only determining factor here is the Republican Party’s recent history in this state and the fact that Trump won this district in 2016. The likely Republican district is the 2nd. Incumbent Scott Taylor is running against Democratic Nominee Elaine Luria, who was in the Navy for 20 years before getting into politics. Luria has a clear name and is a worthy candidate, however, her Democratic opposition in this election who ran against Taylor in 2016 was recently charged with fraud, which damages the Democratic Party’s reputation in this area. Solid Republican districts (like Solidly Democratic districts) are those where the opposing party has no chance of winning. These districts are the 1st, 6th, and 9th. The 1st district, where Stafford is located, has Incumbent Rob Wittman running against Democratic Nominee Vangie Williams. Wittman has won by roughly 30% in the past three elections when running against opponents similar to Williams, so the results with certainly be the same. The solidly Democratic races or the darkest shade of blue on the map are races that will most likely have a Democratic win. In my opinion, in these races, there is virtually no chance of a Republican winning. The Virginia Senate race is between incumbent Senator Tim Kaine (D-VA) and Corey Stewart (R-VA). Senator Kaine has a long history of being in Virginia politics. He has served as the mayor of Richmond, lieutenant governor, and governor of Virginia. He was also Hillary Clinton’s running mate in 2016. Stewart is the current chairman of the Prince William County Board of Supervisors. In every statewide election, Senator Kaine has received over 50% of the vote. For Stewart, this will be a very challenging race to win. The likely Democratic races are those that are the next shade lighter. Ohio, Michigan, Pennsylvania, and Wisconsin are all states that President Trump won in 2016, but they have strong incumbent senators. In addition to the regular Senate race, Minnesota will have a special election to fill the seat of former Senator Al Franken (D-MN), who resigned because of sexual assault allegations. The Governor of Minnesota appointed Tina Smith (D-MN) to fill that position, which she will now defend in November’s election. Recently, Smith did not show up to debate her Republican opponent, Karin Housley. This is a very bad look for Senator Smith, and will hurt her in the election. Minnesota is generally seen as a blue state, but President Trump only lost the state by 40,000 votes in 2016. The leaning Democratic races have very differing landscapes from each other. The incumbent in West Virginia is Senator Joe Manchin (D-WV), who has shown that he is able to work with President Trump, such as voting to confirm Justice Kavanaugh. President Trump won West Virginia with 67.9% of the votes in 2016. Hillary Clinton only received 26.2% of the votes there. This election is an uphill battle for Manchin, but I think that he will be able to pull through because he has great name recognition in the state, and he is very popular. The New Jersey Senate race is between incumbent Senator Robert Menendez (D-NJ) and Republican businessman Bob Hugin. Menendez faced trial for allegations regarding bribery and corruption. CNN has a great article explaining the charges. The trial resulted in a mistrial, but the Senate Ethics Committee “severely admonished” Menendez. This has tarnished his reputation, with a recent Rutgers University poll showing him with only a 5% lead. Hillary Clinton won New Jersey by 14%. This is a major red flag for Democrats who wish to take control of the Senate. The leaning Republican states are Nevada, Indiana, Florida, and Montana. On the map, they are the lightest shade of red. Nevada is the only state out of the four that has a Republican incumbent. Hillary Clinton won Nevada in 2016 with 47.9% of the vote, but Senator Dean Heller (R-NV) won his state in 2012 with 45.9% of the vote. Senator Heller has had President Trump and Vice President Pence visit his state to rally supporters, and I believe his popular standing in the state and becoming much more closer to Trump will equal him a win in November. The Indiana Senate seat is held by incumbent Senator Joe Donnelly (D-IN). The Republican challenger to Senator Donnelly is businessman Mike Braun. This is the home state of Vice President Pence and a frequent rally stop of President Trump, so I am positive that Republicans have a great chance of retaking this seat. Florida is a very interesting race to look at this year. It is a match up between Governor Rick Scott (R-FL) and incumbent Senator Bill Nelson (D-FL). These politicians have been household names in Florida for decades. Senator Nelson (D-FL) began his political career as a United States Congressman in 1979 and then won election to the United States Senate in 2001. Governor Scott (R-FL) has been the Governor of Florida since 2011, and was the CEO of Columbia Hospital Corporation, which became the largest private for-profit healthcare company in the United States. According to Vox.com, Governor Scott (R-FL) has outspent Senator Nelson’s campaign by a 4 to 1 margin. Governor Scott has been a very popular governor, especially handling hurricane disasters very well. This race is difficult to call, but I think Scott will be able to pull it off. The Montana seat is leaning Republican because incumbent Senator Jon Tester (D-MT) won this seat in 2012, while Republican presidential candidate Mitt Romney (R-MA) won the state with 55.3% of the vote. This could be alarming to Republicans, but President Trump won this state with 55.6% of the vote. Also, the Republican challenger, who is the auditor of the state of Montana, was elected statewide in 2016 with 53.6% of the vote. President Trump has made Montana a frequent rally location because it is very possible that Republicans can win this seat in November. The likely Republican states are Arizona, Tennessee, North Dakota, and Missouri. On the map, they are the next shade darker. Two of the states are held by Republicans (Arizona and Tennessee), while two are held by Democrats (North Dakota and Missouri). The Arizona seat is open due to incumbent Senator Jeff Flake (R-AZ) not running for re-election. Republican congresswoman Martha McSally (R-AZ) and congresswoman Kyrsten Sinema (D-AZ) are running to replace Senator Flake. Historically, Arizona is a Republican state and I believe that it will remain that way. Congresswoman Sinema (D-AZ) has come under fire recently because of videos that have surfaced of her saying to a Texas crowd “Stop your state from becoming like Arizona,” in another video, she refers to Arizona as a “Meth lab of democracy,” in another video, she compares her state to Lindsay Lohan, “We’re not famous in a good way, we’re famous in a Lindsay Lohan kind of way.” These remarks have led the Arizona State Troopers Association to withdraw their endorsement of Sinema. Is this really the person the people of Arizona would like to elect as Senator? These videos seem to have killed her campaign in the state, and it would take a miracle to revive it. At the beginning of this election cycle, many thought that the state of Tennessee could be a pick-up for the Democratic Party. Incumbent Senator Bob Corker (R-TN) chose not to run for re-election. The Election is between Congresswoman Marsha Blackburn (R-TN) who has been representing the 7th District of Tennessee since 2003 and former Governor Phil Bredesen (D-TN) who was governor from 2003 to 2011. This race was shoved into national spotlight when celebrity artist Taylor Swift announced on Instagram that she will be voting for Bredesen, “As much as I have in the past and would like to continue voting for women in office, I cannot support Marsha Blackburn. Her voting record in Congress appalls and terrifies me,” Swift says. A poll conducted by the New York Times after Swift’s endorsement of Bredesen has Blackburn up by 14%. Polls can not be seen as 100% accurate, but this is a clear sign that it will not have a major effect on the race. Those living in middle America do not like being told what to do by Hollywood and celebrities, and the action could possibly hurt Bredesen’s chances. North Dakota is a state that the Democratic party thought that they could hold onto. This Senate seat is held by Senator Heidi Heitkamp (D-ND) and is being challenged by Congressman Kevin Cramer (R-ND). Senator Heitkamp recently voted “no” on the Kavanaugh confirmation vote, which cemented her future. President Trump won North Dakota with 63% of the vote. The voters of North Dakota expected their senator to vote for the judicial nominations of President Trump. Senator Heitkamp has not fulfilled this expectation, which is proven with a recent poll conducted by Gray Television, which has Cramer (R-ND) leading by 16%. Also, Congressman Cramer has won statewide election 3 times because North Dakota is only given 1 representative in Congress. He won in 2012 (55% of vote), 2014 (55% of the vote), and 2016 (69% of the vote). This proves that he is capable of winning statewide and replacing Senator Heitkamp. Missouri’s incumbent Senator Claire McCaskill (D-MO) is in a similar position as Senator Heitkamp (D-ND). Senator McCaskill is being challenged by the Attorney General of Missouri Josh Hawley (R-MO). In a recent undercover video released by Project Veritas, where a regional director for her campaign explains that she does not reveal her true position on gun control and that she could possibly vote to impeach President Trump even if she runs on telling voters that she will not. This is a major concern for Republicans and independents who had thought about voting for McCaskill over Hawley. What they would have voted for is not what they would have got. Senator McCaskill has won statewide in Missouri twice, in 2006 (49% of the vote) and 2012 (54% of the vote). Attorney General Hawley won statewide in 2016 with 59% of the vote, which proves he is able to win with a larger margin statewide than McCaskill. The solidly Republican states are Utah, Wyoming, Nebraska, Mississippi 1, Mississippi 2, and Texas. On the map, they are the darkest shade of red. These races that will most likely have a Republican win. In my opinion, in these races, there is virtually no chance of a Democrat winning. The most interesting race out of the solidly Republican states is Texas. The incumbent is Senator Ted Cruz (R-TX). He is well-known across the country because of his presidential campaign in 2016 and the final opponent of President Trump during the Republican primary. The Democratic party nominated Robert O’Rourke to take on Cruz. O’Rourke (D-TX) is the current congressman for the 16th district of Texas. According to the Center of Responsive Politics, O’Rourke has received over 60 million dollars from direct contributions, while Cruz has received over 35 million dollars from direct contributions. Senator Cruz will win re-election because of several factors. The governor of Texas, Greg Abbott (R-TX), is extremely popular and will cruise to re-election, thereby helping Cruz get more Republican voters to the polls. Also, President Trump recently held a rally for Cruz in Houston, Texas, where over 100,000 people requested tickets to attend. Historically, Texas is a red state that will not shift blue anytime soon. Like the solidly Democratic states for U.S. Senate, these districts will most likely have a Democrat win. These districts are located in Northern Virginia, Richmond suburbs, and the Hampton Roads region. The leaning Democratic district is the 10th district seat held by Congresswoman Comstock (R-VA). Hillary Clinton won this district in 2016 with 52% of the vote, while Comstock won with 53% of the vote. This means there were a lot of cross-party voters, but the Democratic party is very energized, especially in this district which is located in the Washington D.C. suburbs. Both candidates have spent millions on this race, making it the most expense race in Virginia this year. Comstock has proven that she has the capability of winning in tough election years, but I am not sure if she will succeed this year. The leaning Republican district is the 7th, which is currently held by Congressman Brat (R-VA). Congressman Brat won this seat in 2014 (60% of the vote) and in 2016 (58% of the vote). Brat has proven that he is a strong candidate in this district. I am not sure why the Democrat Party believes that they have a strong chance of winning, but according to the Virginia Public Access Project, his opponent, Abigail Spanberger, has spent close to 6 million dollars. I think Congressman Brat will survive this election, but it will be a lower margin than he typically wins by. The likely Republican districts will most likely have a republican win. There is nothing notable to report in the 2nd and 5th districts. The solidly Republican districts have a very high chance of a republican win. This includes the district that contains Stafford County, which is held by Congressman Rob Wittman (R-VA). Congressman Wittman has been the representative of this district since 2007. He is very well-known in this conservative-leaning district and his opponent, Vanige Williams is lesser known. President Trump won this district with 53% of the vote in 2016, while Wittman won it with 60% of the vote. This proves that Wittman is able to win support from independents and democrats. The other districts that are solidly Republican are the 6th and 9th. President Trump won the 6th district with over 60% of the vote and he won the 9th district with close to 70% of the vote. There is really no chance that a Democrat could win in those atmospheres.